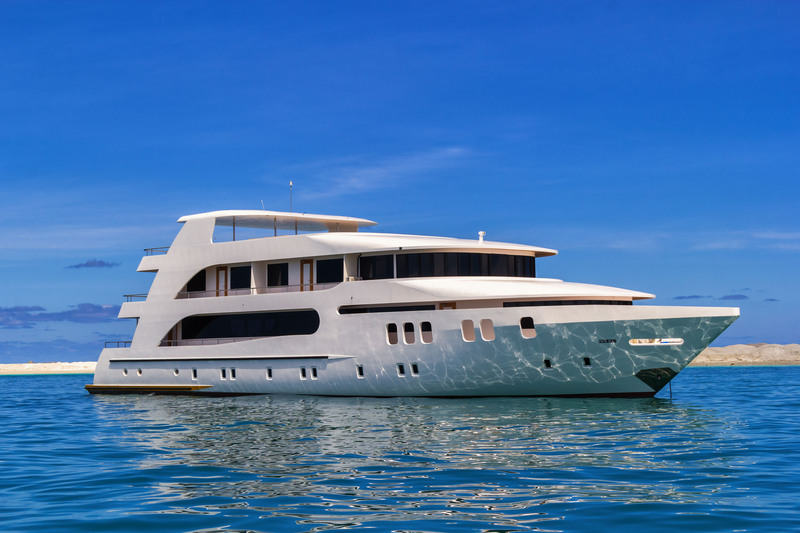 Adora is a 37m motor yacht with 3 decks featuring 11 spacious cabins each with private bathroom. 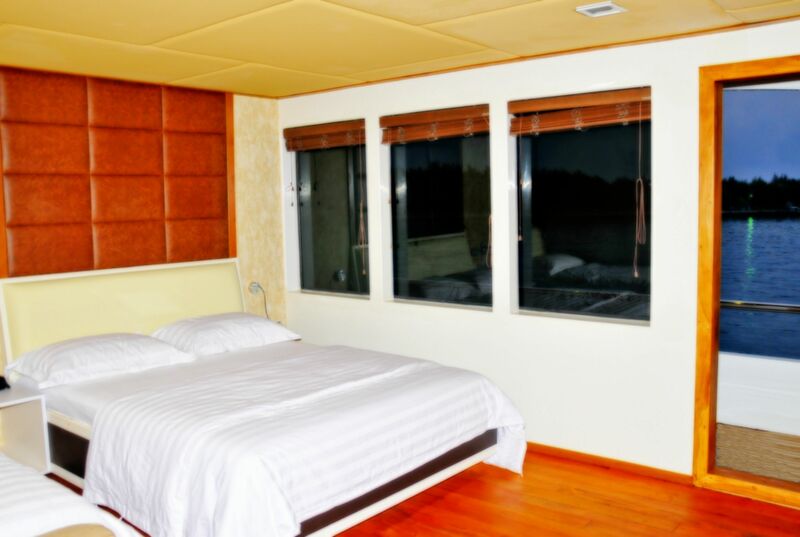 Guest can enjoy a view of the ocean from the ocean view suites on the third deck. 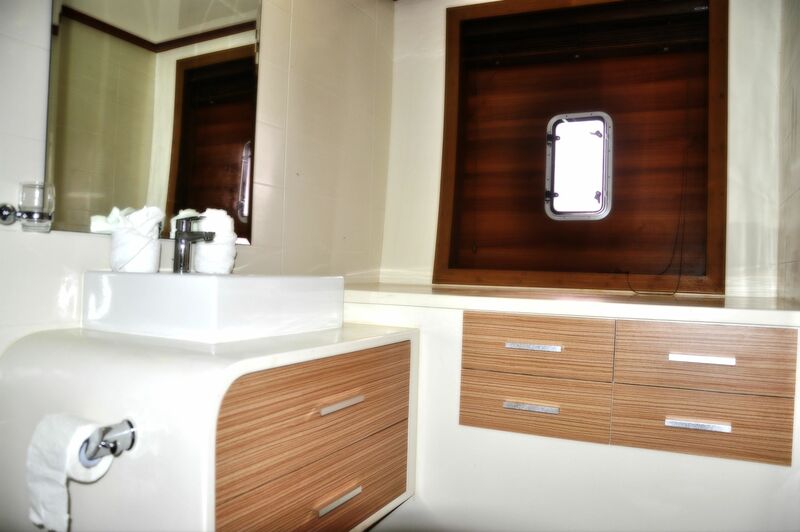 Stylishly designed, the yacht provides maximum tranquillity and comfort at sea. 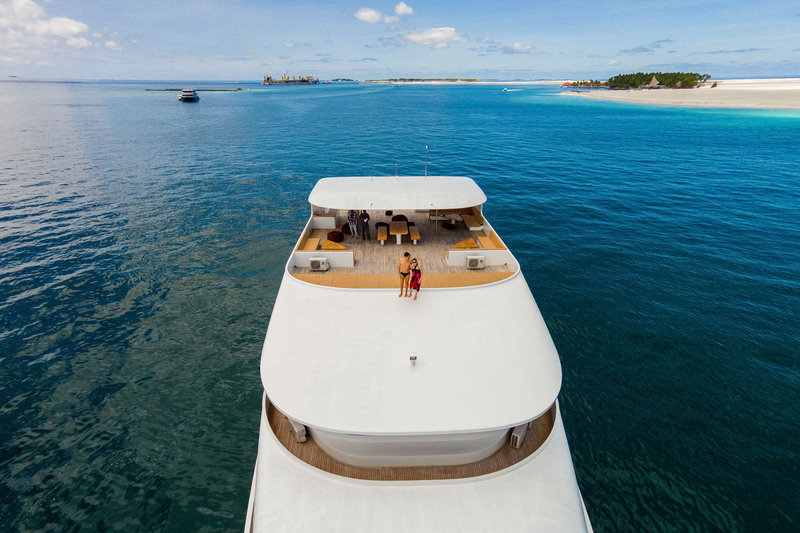 The yacht is one of the few boats in the Maldives built with fiber making it much lighter. This allows faster cruising and hence less time sailing and more time surfing! 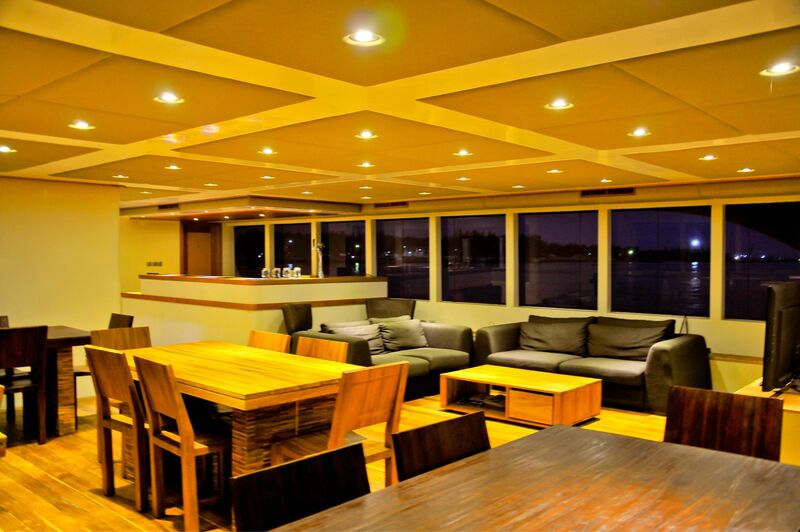 Boat Trip in Male Atolls with all included! 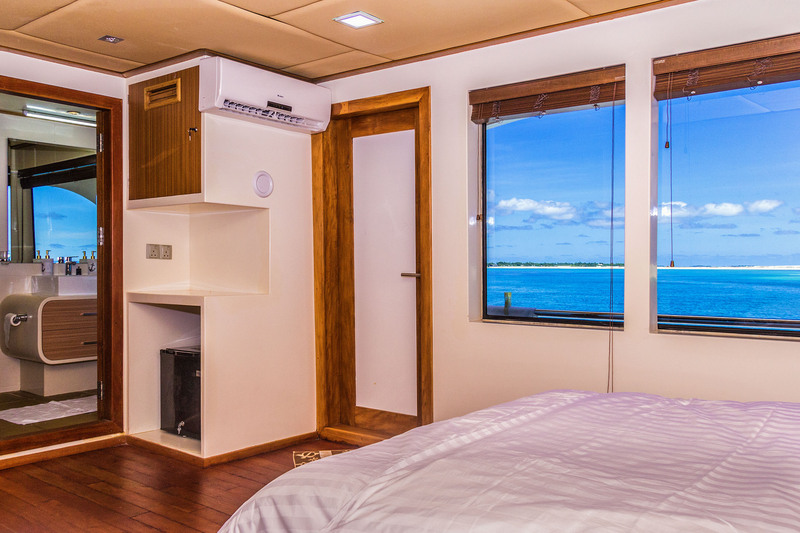 Boat Trip in Central Atolls with all included! Round circuit Itinerary also available. Ask us prices! 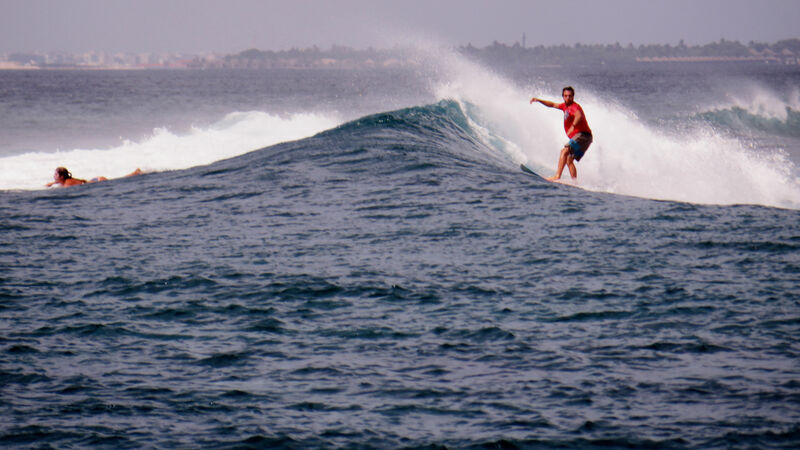 (Surfing only in Central Atolls - Meemu, Thaa and Laamu. Starting from & arriving to Laamu airport. One Way & Return flight between Male airport and Laamu airport (40 mins): extra aprox USD 410.00 (Per person). 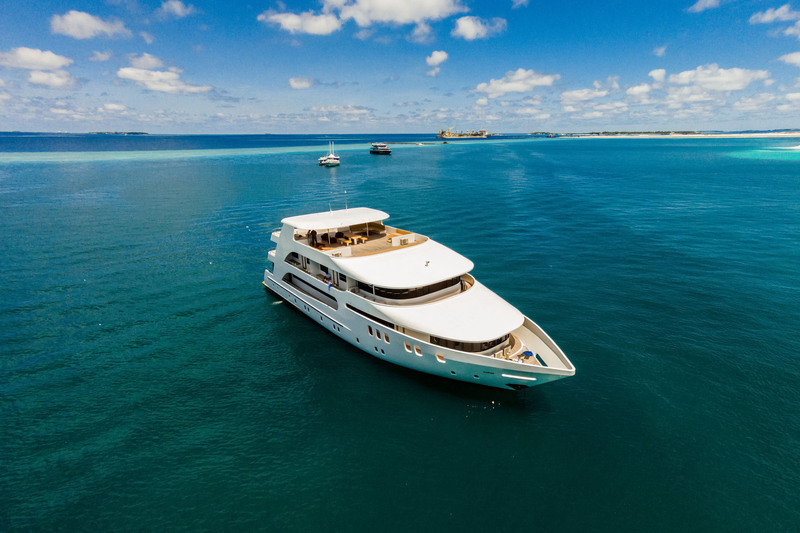 Boat Trip in South Atolls with all included! Round circuit Itinerary also available. Ask us prices! (Surfing only in Gaafu Dhaalu Atoll. Starting from & arriving to Gaafu Dhaalu airport. One Way & Return flight between Male airport and Gaafu Dhaalu airport (60 mins): extra aprox USD 450.00 (Per person). Internet Wifi is available in common area. 2 GB / 3G internet stick is available for purchase for single user. The Maldives focus on all that is good in a tropical destination! An excellent temperature that never goes below 28ºC for a whole year, hot and translucent water, paradise beaches and many waves! It is a surf destination that has become increasingly popular among European surfers who lately have been reaching a reasonable level of surf that allows them to surf these incredible reef breaks. There are many islands with good waves but you must know where and when is the best time to surf them. 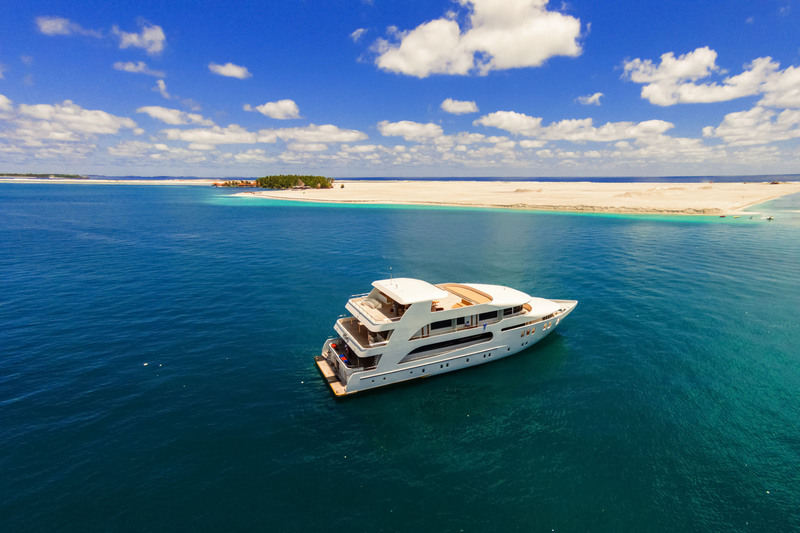 The best way to discover these spots is undoubtedly by boat, which allows you greater mobility to surf different waves every day adjusted to your surfing level. In addition to surfing, the Maldives also offer the possibility of other aquatic activities such as snorkelling or diving and tours in deserted islands. It is therefore a perfect destination to bring your girlfriend/boyfriend despite not surfing, will have a number of nice things to spend the time. Adora is a reference boat here in the Maldives. It is one of the very few built in fiber to make it lighter and therefore more sustainable and faster cruising. This allows to reduce the time travelling in between islands and spend more time doing what you like, surfing or diving! 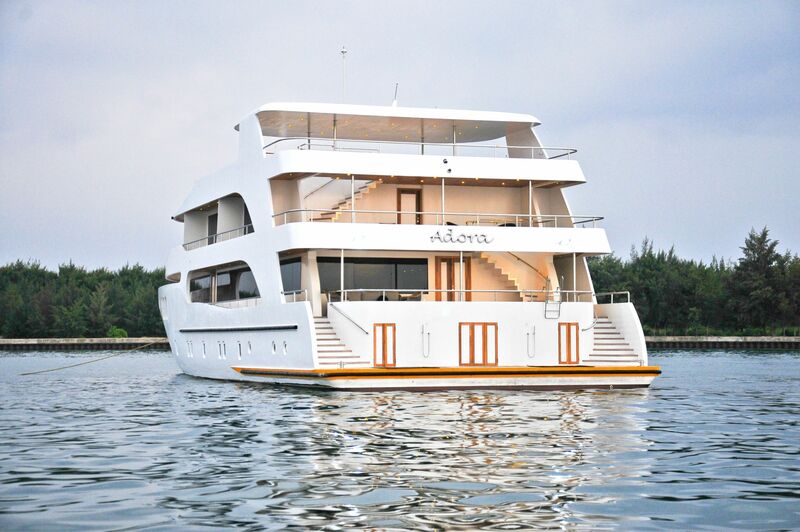 Also, Adora is one of the biggest, newest and most modern boats cruising in the Maldives. 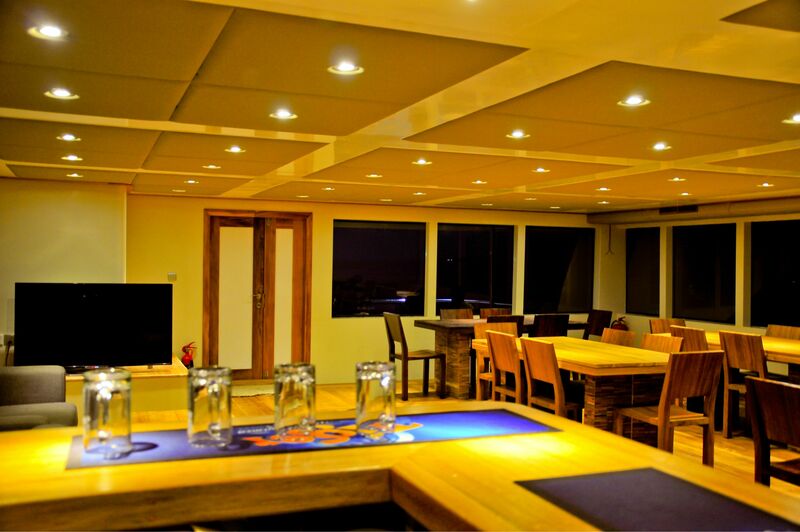 It has all the more modernised techincal equipment for sailing, engine and guest facilities. 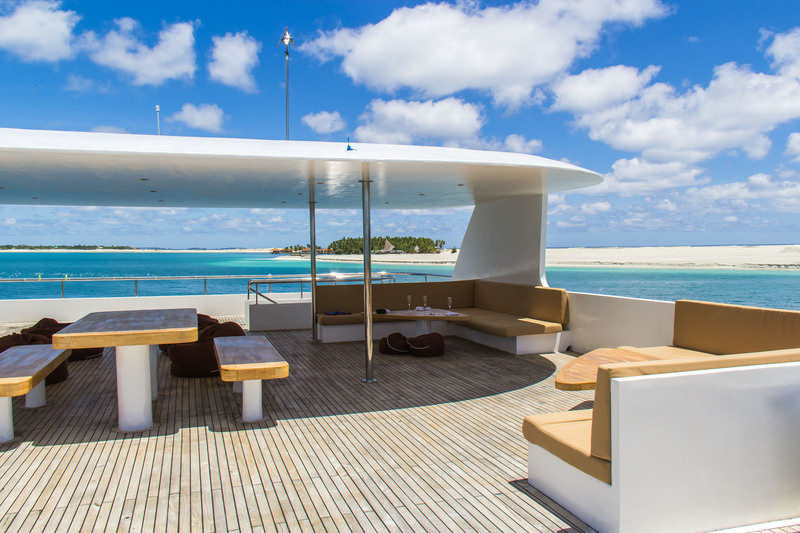 This is probably the best boat in the Maldives catered by an experience team at your service to provide you an unique experience. 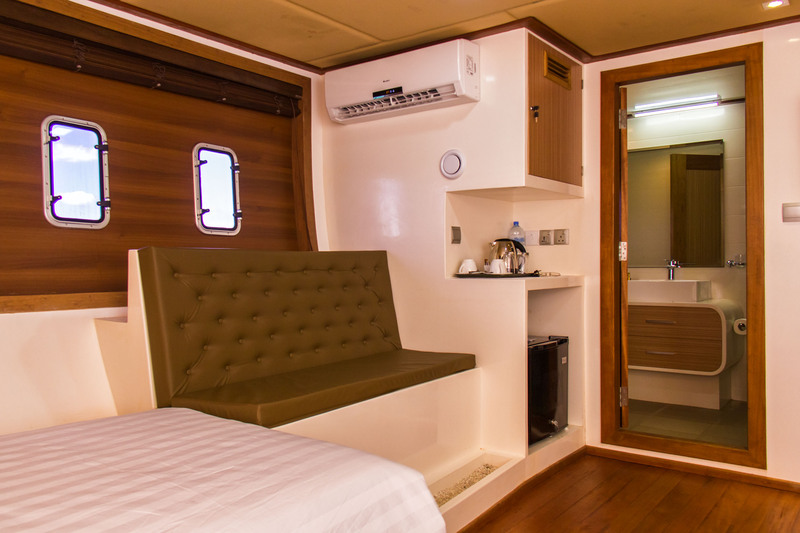 This wonderful boat has 6 standard rooms in lower deck, 1 single suite in mid deck and 4 ocean view suites in top deck with private balcony. 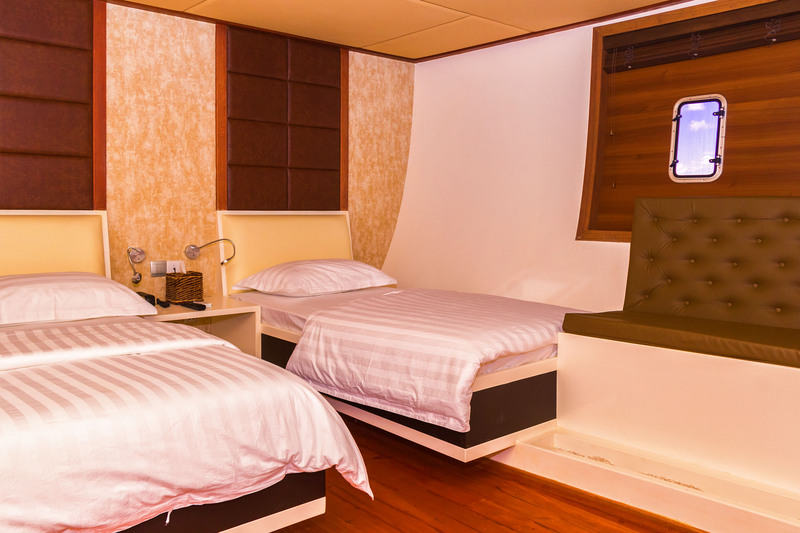 All rooms are equipped with TV and a Media box with selection of movies. 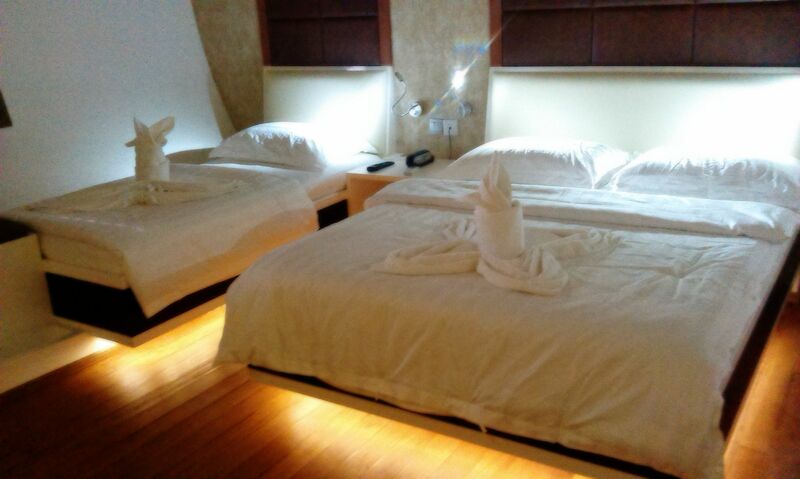 All rooms have private bathroom with hot/ cold shower. Towels are provided. every day by our staff. 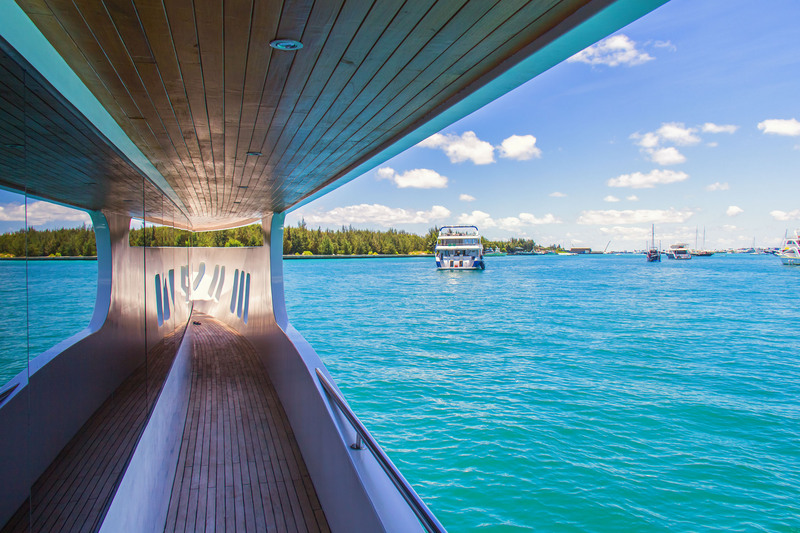 This is the boat to book if you want to get the very best of the Maldives! At least once in a lifetime you have to surf in the Maldives! It is a mandatory destination for all intermediate or experienced surfers. The perfect long waves make the delight of all the surfers who travel to the Maldives every year. 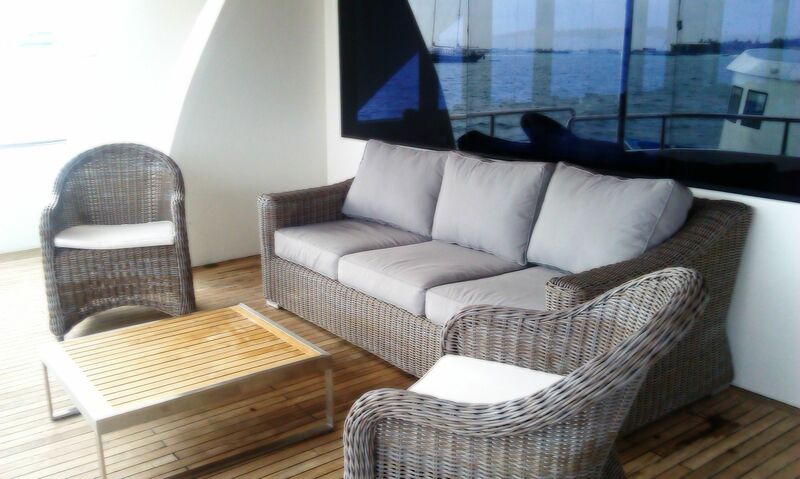 The offer is immense from north to south of the archipelago! It is well known that it is the Male Atolls that focus on the most popular surf spikes such as Cokes, Chickens, Sultans, Honkis etc. But it's to the south where there are still untapped peaks with equally good waves but no crowd. One can surf in the Maldives any time of year but there are specific heights where conditions are better on one side than on another. You must know WHEN and WHERE to go in the Maldives every time of the year to make the most of surfing in the Central Atolls and Atolls of the South. We are here to help you and if you want to book one of these trips to the south. 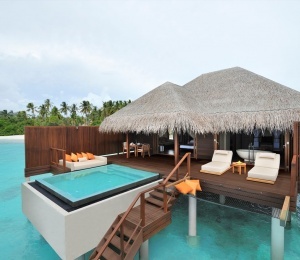 Tesmo experience in arranging these tailor made trips to anywhere in the Maldives. SURFINN © 20-04-2019 12:48:14. ALL RIGHTS RESERVED.